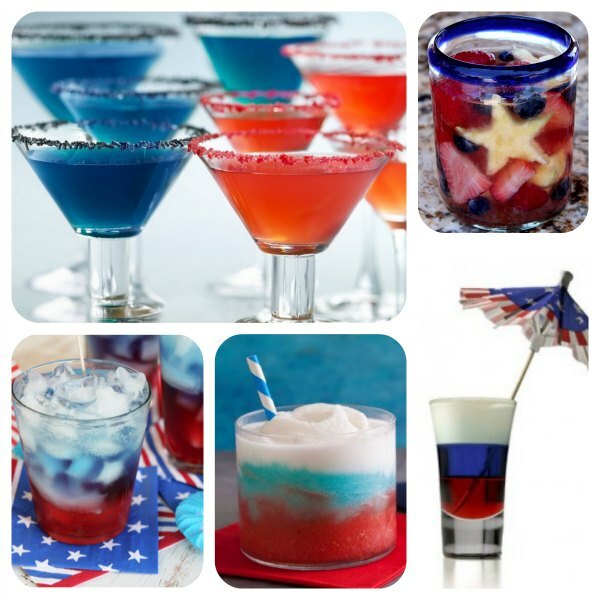 Patriotic Drinks: Perfect for the 4th of July Celebrations! Here’s a few Patriotic Drinks you may want to try for your 4th of July Celebrations! Most of these are fairly simple to make too. Spice up your holiday celebrations with a cute display of Patriotic Punch. Cleverly composed so the colors are still separated when you serve it! The red punch has more sugar which means it’s heavier keeping it at the bottom. I’ve also seen this same idea floating but with colored sugar or Pop Rocks around the rims of the glasses on Pinterest How clever is that! Here’s a Betty Crocker recipe you don’t want to miss! Patriotic Margaritas! This recipe is make with tequila (clear) but I’ve also seen it made with Vodka (my personal fav!). Oh Good Lord this Red, White & Blue Sangria looks delish! In this one you will combine white sangria, triple sec and berry flavored vodka. Add some red, white & blue fruit and that makes one very Patriotic drink if I do say so myself! Your party just won’t be complete without the sweet taste of Fireworks Red, White & Blue Daiquiris! Besides, this frozen treat is sure to cool you off during these hot days too! Grab your blender and combine a few ingredients to make this delicious treat for you and your guests! I’m sure they will be super impressed! This one is not for the weak! If you are up for it, why not try the Red, White and Blue Shot! It’s made with Grenadine, Blue Curacoa and Vodka! Prep time is only 2 minutes! I’m not so sure that is a good thing though. There is also an option to switch out the vodka for peach schnapps too. Especially if you need something a bit lighter. Cheers to the Red, White and Blue!!! What are your 4th of July Celebration plan?